It is safe to say that in Los Angeles these days it is hard to find a cheap, good meal. Not on Vine between Santa Monica Boulevard and Melrose Avenue. I am talking cheap, good and as authentic as you will get for Mexican food. I am talking Cactus Taqueria and it ain’t your higher priced organic / healthy style of Cali-Mex-Whole Foods fair, not one bit. When I say cheap I mean $1.25 for a taco, and the tacos are damn good! Just like the one I had in Tijuana a few years back. Of course if you are a taco fan you probably know of this joint that opened in 1992, and sits across the street from the grade school that Marilyn Monroe attended. The LA Taco blog puts Cactus as the #1 Taqueria – Hollywood, and while I would not go that far (I like the Mex-Whole Foods style) I definitely rank it the cheapest and best for the $ in the area. While I have only had the beef and carnitas tacos, I can guarantee from the long lines at lunch, and the jam-packed lines during the weekend that Cactus makes millions of people happy each year. The red sauce is HOT, so be warned unless you go that way, and a ten-year veteran of Cactus tells me the beef burritos (a little more pricey at $7) are his the best in the city. That is if you can afford them!! 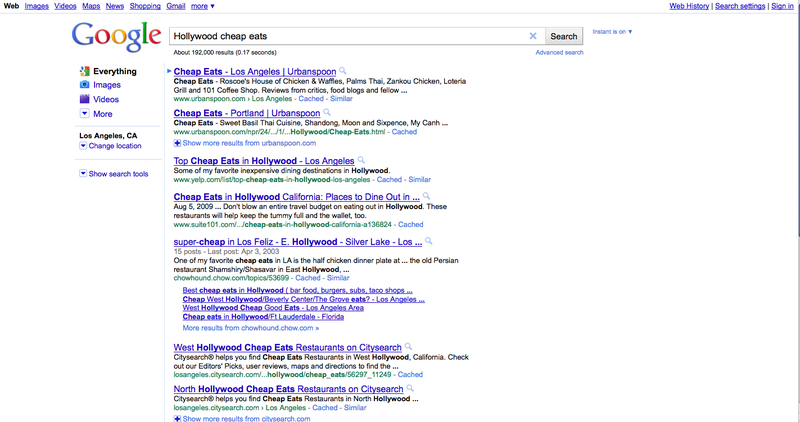 If you are wondering why I am blogging about old cheap restaurants in Los Angeles, well just look at how Google sold out when you type in Hollywood Cheap Eats. Is Yelp and Urban Spoon really the only people talking about cheap eats out there? All you get is Urban Spoon that lists Cafe 101, or In-N-Out Burger. Both relatively cheap but they all break the $5 mark (and 101 breaks the $15 dollar mark jeez!). Yelp isn’t much better. So to sheer away from the Google advertising blitz I bring the truly cheap that is worth eating. So next time you are in Hollywood and you only have some parking change left and you need to eat, and you can’t seem to find your favorite taco food truck, then Cactus Taqueria can fulfill your need. 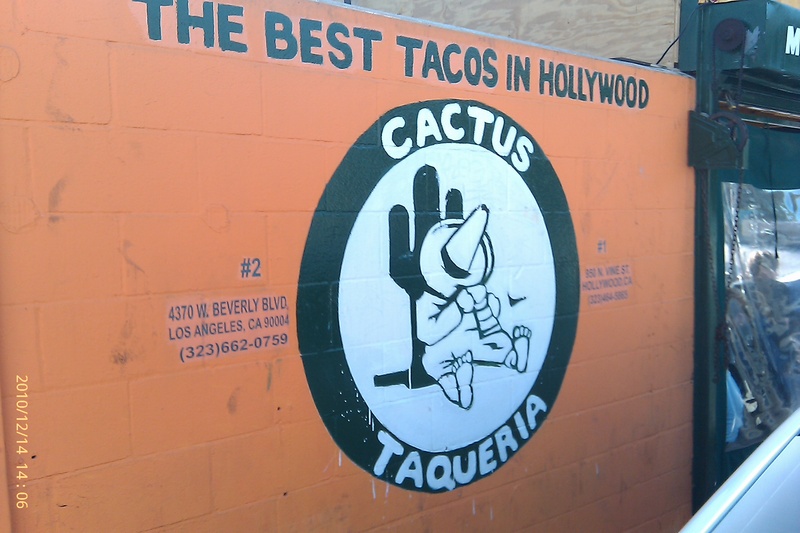 CORRECTION: The above posting mistakenly referred to Cactus Taqueria as the #1 spot in Hollywood ranked by LA Taco, when in fact I have been informed that Cactus Taqueria #1 is actually just the full name of the Taco joint. Per the comment below left by LA Taco they rank it as not #1. My bad!!!! UPDATE: I have come to understand that this location is called Cactus Taqueria #1 because there is Cactus Taqueria #2 at another location in Los Angeles. Location #2 is located at 4370 W. Beverly Blvd, Los Angeles. 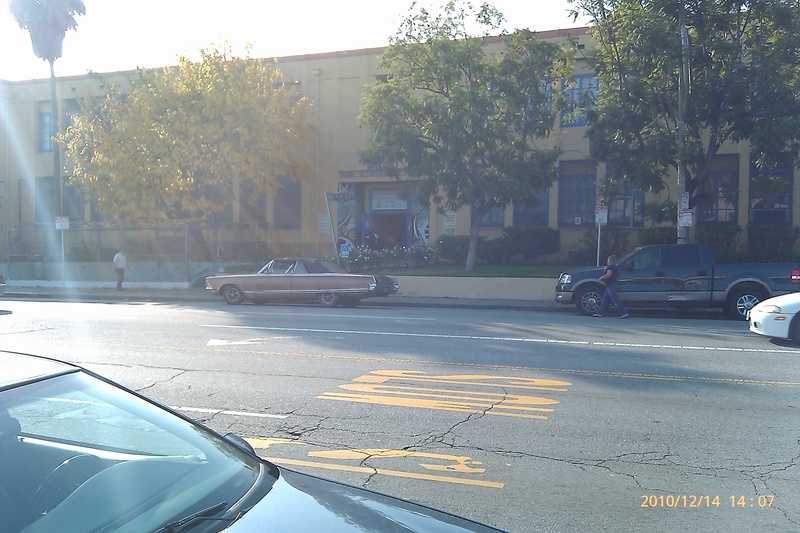 LAUSD Vine Street Elementary School where Marilyn Monroe was said to attend grad school. This entry was posted in Cheap Eats, Food, Hollywood, L.A., LA, Los Angeles, LosAngeles and tagged $1 dollar, Cheap Eats, Food, Hollywood, L.A., Los Angeles, Taco. Bookmark the permalink. Thanks for the link, Aaron! 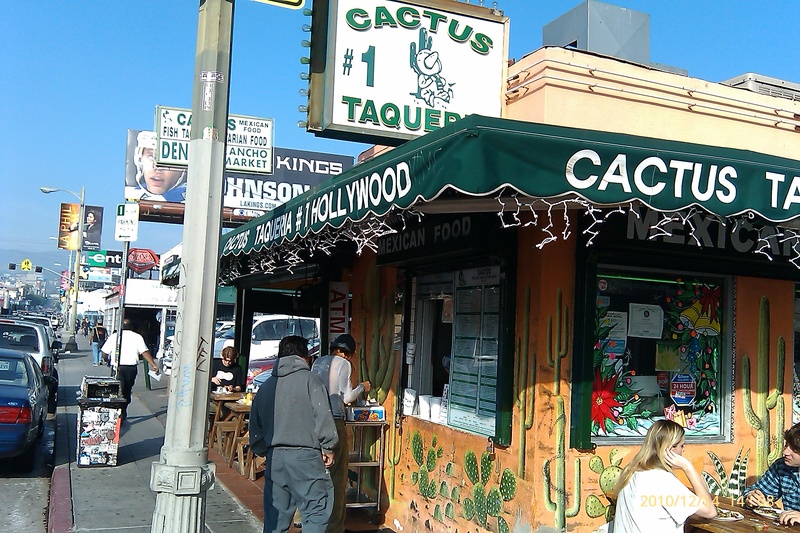 Just for clarification, L.A. TACO never called it the “Number One” Taqueria, but that’s just the name, Cactus Taqueria #1. It doesn’t rank that high on my list, though it’s a pretty good one for the area.